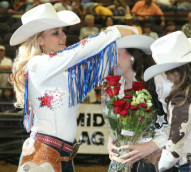 Congratulations on earning your rodeo queen title! Whether you are a seasoned titleholder or just beginning your journey there are a lot of tips which will help you have a successful reign. Our best tip is to simply enjoy the ride. Make the most of your reign by taking the opportunities presented to you and share those moments with your family. Take a lot of photos and put them into a scrapbook as soon as possible so you are able to remember the details.